Effluent pumps are designed to move graywater out of a building water system. Graywater is simply all the water that is used throughout the day and may contain solids, such as shower water (the exception is wastewater or sewage). Effluent pumps are typically used to move graywater out of laundry tray systems, septic tanks or sump pits. 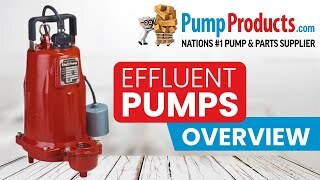 PumpProducts.com sells effluent pumps and filtered effluent pumps from top brands such as Goulds, Zoeller and Hydromatic.